Getting things done around the yard and in your shed can be no sweat with these smart solutions! In summertime, the backyard becomes a major destination. There’s gardening and barbecues, to be sure, but the possibilities multiply when you throw a shed into the mix. People all over are discovering how having a shed lets them take their favorite activities alfresco, transforming that nifty little outbuilding into a workshop, art studio, home office, or even a gym! Comfort is key if you’re planning to spend long days out in the yard when the weather is warm. To beat the heat while you’re out in your shed pursuing your passions, consider implementing these three smart strategies. Whether you’re setting up a potting shed, an office, or a studio, start with building materials engineered to lower interior temperatures. 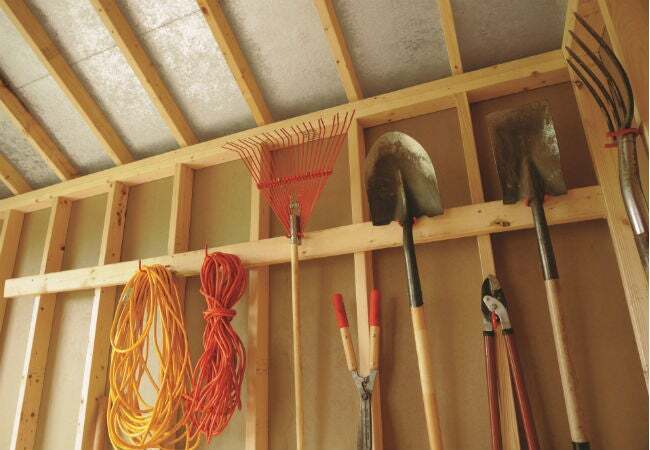 A shoddy shed made from inferior products can act like a heat and humidity magnet—not ideal for work or storage. LP, a proven leader in high-performance building products, developed problem-solving Outdoor Building Solutions® products to reduce the effects of the sun’s radiant heat on your shed: LP® SmartSide® Panels with SilverTech® and LP ProStruct® Roof Sheathing with SilverTech®. When incorporated into interior walls and ceiling, respectively, these ingenious building products drastically reduce the amount of heat radiating from the sun-warmed shed exterior inward, where it could hammer down on you at your desk, easel, or bench. Complement a shed built from quality materials with a few of the right extras to enhance your comfort. Place awnings above windows and doors that aren’t already shaded by nearby trees to help keep your shed cooler. Overhangs can reduce solar heat gain in the summer by up to 77 percent on west-facing windows and 65 percent on south-facing windows, according to the U.S. Department of Energy. And awnings aren’t just practical—they add personality and distinctive style to your shed, making you want to spend even more time out in your yard. Tip: Consider installing retractable awnings that you can roll back in when chilly temperatures arrive. With the windows fully exposed to the autumn rays, the passive heat of sunlight will keep you warm—and plugging away—in your shed! Increasing and maintaining airflow is another secret to a cooler shed. As a bonus, air circulation will also keep excess moisture and humidity at bay. Ventilation is even more critical if you plan to work with chemicals like paint or varnish in your shed. The size of your shed will inform your decision as to what type of strategic ventilation or fans to install. For instance, a turbine ventilator (also called a whirlybird) that works well on the roof of a large outbuilding would overwhelm a smaller shed, where a simple louver vent on both ends ought to suit just fine. 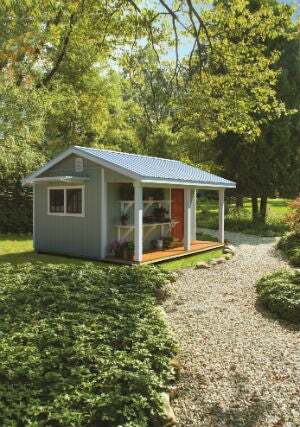 How you use your shed should factor in, too. If your workshop will be wired for electricity, a powered exhaust fan is ideal—it will push out hot air and draw in cooler air. An artist who wants to work beneath a skylight, on the other hand, might consider one that vents: Since skylights, like your average windows, let in both light and heat, choosing vents made of hard, clear plastic can let some hot air escape while bringing in the natural light that’s so crucial to the creative process. However you plan on enjoying your shed this summer, first take a few steps to guarantee a pleasant, productive experience. LP’s network of shed dealers can help you get started.